What Does Walking in Freezing Weather Do to Your Lungs? It is said that freezing weather can chill you to the bone. Not only does your body feel uncomfortable during inclement weather, but your lungs are also affected when the temperatures freeze. The lungs function best in warm, humid weather. When you venture outside in freezing weather, you may find it difficult to breathe. Symptoms are worse if you have lung disease. The best course of action is to stay indoors, but there are steps you can take if you have to venture outside during freezing weather. Seek immediate medical attention if you experience chest pain. Your lungs require warm, humid air to function. When you breathe through the nose, oxygen has an opportunity to warm slightly before reaching the lungs. Breathing cold air through either the nose or the mouth causes your airways to constrict. The air you breathe during freezing temperatures lacks humidity to lubricate the bronchial tubes. Breathing difficulties occur as your airways tighten. Some symptoms include dry mouth, wheezing, coughing and shortness of breath. Exercise worsens the effects of freezing temperatures on yon the lungs. When you exercise, you are more likely to breathe in through the mouth to obtain oxygen. The American Academy of Allergy, Asthma and Immunology explains that breathing through the mouth in freezing temperatures puts your lungs at risk of exposure to dry, cold air. For this reason, cold-weather sports are more likely to cause lung problems. Examples include ice hockey, figure skating, snow boarding and skiing. If you have a respiratory disease, such as asthma or emphysema, you are at a greater risk of symptoms related to freezing temperatures. Asthma causes your bronchial tubes to inflame and constrict. Cold weather worsens bronchial constriction; therefore your asthma and emphysema symptoms are likely more prevalent during the winter months. According to the American Academy of Allergy, Asthma and Immunology, exercise-induced asthma symptoms occur exclusively after working out. If you have any type of respiratory disease, it is best that you exercise indoors during freezing weather. 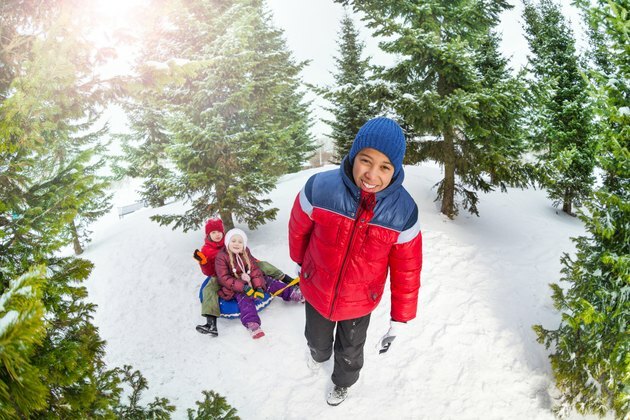 You can take steps to ward off the effects of cold weather on your lungs. When you are outdoors, the Mayo Clinic recommends breathing through your nose, not through the mouth. The air breathed through your nose will have a chance to warm up before entering your lungs. If you are going to be outdoors for an extended time, try wearing a cold-air mask. When you get home, make sure you plug in a humidifier. Asthma and emphysema patients need to take additional steps to prevent symptoms during extreme cold weather. Make sure you take all recommended medications, and see your doctor if your symptoms worsen. Don’t remain outdoors for an extended period of time if you experience chest tightness, wheezing and breathing difficulties.